10 x € 110.00 / mėn. ? The FUJIFILM X-T2 features a 24.3 MP X-Trans CMOS III APS-C sensor for outstanding image quality. Its highly random pixel array effectively reduces moiré and false colors without the use of an optical low-pass filter. When combined with an XF lens, the sensor delivers images with a perceived resolution far greater than the number of pixels used. Other features include outstanding read speed, high-speed continuous shooting, high-precision AF tracking, highly faster liveview refresh rate and superb video recording. Choose Face Detection to automatically detect human faces, or turn on Eye Detection AF to automatically detect and accurately focus on human eyes for successful portraits with a shallow depth of field. You can also define the area of priority focus, for example right or left eye, or the eye closer to the camera. 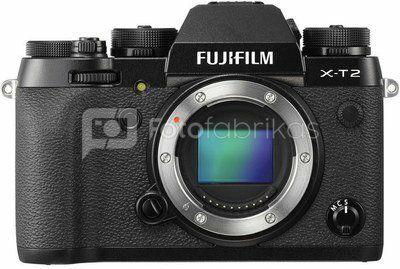 These functions have been upgraded for improved accuracy to a level that will impress professional photographers. The 2.36-million-dot high-resolution organic EL electronic viewfinder has a magnification ratio of 0.77×, a horizontal viewing angle of 31 degrees, and a display time lag of just 0.005 seconds. The viewfinder, which is 2 times brighter than the previous model, also features an automatic brightness adjustment function so it's easy to see in all conditions - even intense backlighting. It completely eliminates moiré or false colors, and boasts performance comparable to an optical viewfinder, but with the added advantage of displaying a live view that reflects exposure settings. As standard, the EVF refreshes at a rate of 60 fps, but in Boost mode this jumps to 100 fps, which continuously displays even fast-moving subjects smoothly to deliver a performance comparable to that of an optical viewfinder. The fast refresh rate is maintained even in low light for easy framing during night shooting. 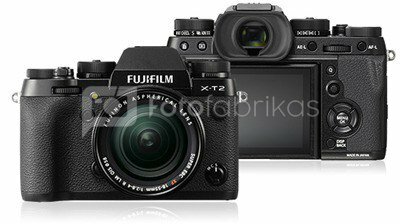 The FUJIFILM X-T2 captures approx. 1.8x the required number of pixels for 4K video (4K/30P, 25P, 24P) and 2.4x the required data for full HD video (1080/60P, 50P, 24P) to deliver superior movie quality free from moiré or artifacts. It also supports the high bit rate of 100 Mbps. Highly-durable focal plane shutter with a maximum speed of 1/8000 sec. The FUJIFILM X-T2 features a focal plane shutter with a maximum speed of 1/8000 sec, flash sync speed of 1/250 sec and durability of 150 000 shots. It also supports an ultra-fast, silent-operating electronic shutter with a maximum speed of 1/32,000 sec that allows you to shoot at wide apertures, even in bright sunlight. The Vertical Power Booster Grip VPB-XT2 can fit two batteries to boost the maximum number of shots per charge to approx. 1000. It not only lets you hold the camera vertically more confidently, but also features a shutter release button, Q button, focus lever, command dials, AE-L button and more to maintain the same level of excellent operability during shooting. The grip features a tripod mounting socket in line with the camera's optical axis, and is resistant to dust and water. The grip itself has battery-charging functionality, and is capable of fully charging two batteries in two hours.